A new complaint against Charter Communications filed on Friday by Sony, Universal and Warner asks for legal redress for Charter's alleged failure to disconnect people repeated accused of copyright infringement; the complaint specifically lists the provision of a higher-speed tier of internet service as evidence that Charter was profiting from infringement. 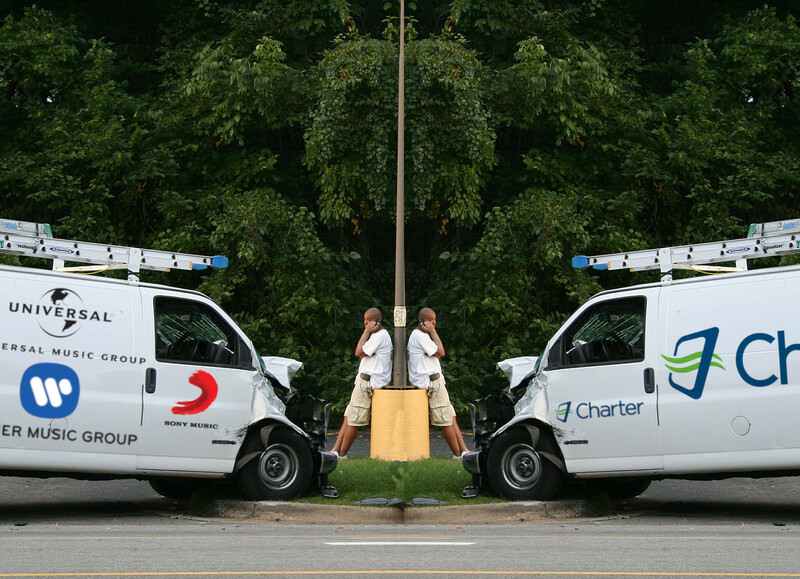 Charter is one of America's bloated, corrupt, terrible telcoms monopolists; thanks to their lobbying and monopolistic practices, disconnecting someone from Charter's network often means disconnecting them from the internet altogether (remember, 100 million Americans live in areas where every single ISP has admitted to violating net neutrality). The record companies are seeking household-level disconnections from a service that is crucial for conducting life in the 21st century, on the basis that someone within wifi range of those homes might be listening to music the wrong way. This lawsuit is a wake up call: the monopolization of the telcoms sector combined with the corruption of copyright as a tool wielded by giant corporations against individuals (as opposed to a regulatory framework for the entertainment industry's internal negotiations) represent a kind of late-stage-capitalist existential threat to human thriving itself. We need to break up Big Telcoms, Big Tech, and Big Content. This is a ghastly slow-motion train wreck and we can't afford to ignore it. Many of Charter's customers are motivated to subscribe to Charter's service because it allows them to download music and other copyrighted content—including unauthorized content—as efficiently as possible. Accordingly, in its consumer marketing material, including material directed to Colorado customers, Charter has touted how its service enables subscribers to download and upload large amounts of content at "blazing-fast Internet speeds." Charter has told existing and prospective customers that its high-speed service enables subscribers to "download just about anything instantly," and subscribers have the ability to "download 8 songs in 3 seconds." Charter has further told subscribers that its Internet service "has the speed you need for everything you do online." In exchange for this service, Charter has charged its customers monthly fees ranging in price based on the speed of service. Wisconsin's Pardeeville Area Shopper is a one-person family business run by Candace Lestina, whose mother founded the weekly paper; like all businesses, the Shopper needs internet service, and like most American businesses, the Shopper is at the mercy of a terrible, monopolistic ISP, in this case, Frontier.